About the Book: The former General-in-Chief of the Union armies during the Civil War . . . the two-term president of the United States . . . the beloved ambassador of American goodwill around the globe . . . the respected New York financier—Ulysses S. Grant— was dying. The hardscrabble man who regularly smoked twenty cigars a day had developed terminal throat cancer. Thus began Grant’s final battle—a race against his own failing health to complete his Personal Memoirs in an attempt to secure his family’s financial security. But the project evolved into something far more: an effort to secure the very meaning of the Civil War itself and how it would be remembered. The new of Grant’s illness came swift on the heels of his financial ruin. Business partners had swindled him and his family out of everything but the money he and his wife had in their pockets and the family cookie jar. Investors lost millions. The public ire that turned on Grant first suspected malfeasance, then incompetence, then unfortunate, naive neglect. In this maelstrom of woe, Grant refused to surrender. Putting pen to paper, the hero of Appomattox embarked on his final campaign: an effort to write his memoirs before he died. About the Author: Chris Mackowski has recounted Grant’s battlefield exploits as a historian at Fredericksburg and Spotsylvania National Military Park, and as an academic, Mackowski has studied Grant’s literary career. 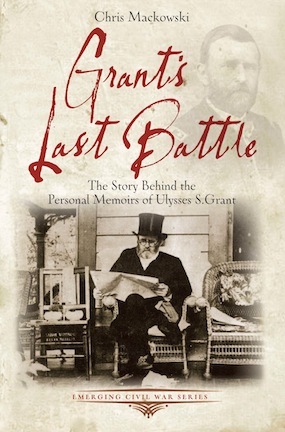 His familiarity with the former president as a general and as a writer bring Grant’s Last Battle to life with new insight, told with the engaging prose that has become the hallmark of the Emerging Civil War Series. Grant also visited Elk and Cameron Counties in 1870 where newspaper articles claim he and is party caught 3000 fish on Bennet’s Branch and First Fork. Chris, Came across your book while I was browsing around Barnes & Noble. Not a fan of Grant so I decided to buy it just to see what I didn’t really know about him. To my surprise I have learned a lot about this man and the hardship he went through after the war. Thanks to you I have a little more admiration for him. Once I started reading your book, I couldn’t put it down. Thanks again for this work.. Thanks so much for the kind words, Charles. I’m glad you liked the book. It was a fascinating book to work on.